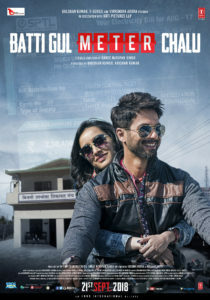 Batti Gul Meter Chalu, directed by Shree Narayan Singh, is an intense story revolving around a legal battle to win back respect for a lost friend. The drama stars the exciting jodi of Shahid Kapoor and Shraddha Kapoor who are known for their fastidious work for any film they agree to do. Audiences have come to expect both a strong story and some fantastic dance moves from their films so there is no surprise then that excitement abounds for this film. The soundtrack too must give both Shahid and Shraddha a chance to show off their talents. Also, the music needs to be tempered to give the dialogue the best chance to flourish but not lose the escapism all Bollywood watchers come to watch these movies for. This job is given to Anu Malik and Rochak Kohli, one a seasoned hand in this type of album, the other a younger version who will be able to bring a new perspective to things. Nakash Aziz is a well-known singer in Telugu circles for a lot of fun dance numbers. Gold Tamba is no different with it’s synth beat backed up by bass guitar. The beat is steady and unchanging, it’s only real change is the addition of a tabla. The lyrics are a mixture of English and Hindi and there are great references throughout the song. But with these references comes the realisation it’s a throwback to Amitabh Bachchan in the 70s. The singer doesn’t have to work too hard and since it’s an old-style 5-minute song, there’s plenty of scope for boredom, but also for a bit of naach gaana and colourful dress changes. Next, we have two versions of the same love song titled Dekhte Dekthe. From the song alone, it’s hard to tell its purpose as both versions are sung by male singers. Inspired by Nusrat Fateh Ali Khan’s ‘Bewafaa Ho Gaye Dekhte Dekhte’, this track has the classic slow rhythms, with heavy acoustic guitar that also includes a keyboard line and a finger clicking sound. There is also a tabla and harmonium section backed up with synth. The first version is fronted by Atif Aslam and not one to be far away from his father’s legacy Rahat Fateh Ali Khan in the second. Overall this feels like an Atif special. His slow melancholic drone is perfect for the reflection upon love that this song provides, and even though Rahat tries his best here to stand out, overall it feels like he is left a distant second. But enough of the depression for now, next we have the ever-lively Mika Singh along with Sachet Tandon and Prakriti Kakar breaking out the film’s super dance track Hard Hard. An opening filled with drums and tabla, it goes into a club beat which seems to underline a bhangra rhythm. Those who played keyboard in their younger days will instantly recognise the bossa nova beat that seems to be gelling the different styles together. The lyrics are an odd combination of English and Hindi given all this work in the beat, but Mika is as ever up to the task. Considering where this album is showing up in the year, of course we would have to end on a religious song. Har Har Gange sung by Arijit Singh features a driving beat. The track’s themes are obvious – take any patriotic song from this year and change the lyrics to thank the gods rather than the country. Not one of Arijit’s finest, but it gets the job done. Considering the tone of the song, it is likely to be played at a critical point of the story and thus very important. The overall feeling of the album is we’re going back to the 90s. It has the 5-song formula that 90s films were so good at. It has a mixture of singers who while are all there on merit and talent, are not necessarily the right people for the song. But each song is individually listenable, and they will in most cases give the audience a break and some escapism before or after the hard-hitting facts of the story. So, this album is for the music directors, it’s for the listeners, it’s for the people who won’t watch the film because it’s so serious but will jump about when ‘Hard Hard’ or ‘Gold Tamba’ comes on their radios. Not a bad rating, but not enough to amaze.